Hookah, or waterpipe smoking, is an ancient Indian practice that has caught on as a social craze in the United States. While 1 in 6 high school seniors have tried hookah, up to 40 percent of college students have experienced this new trend; a trend that has watched hookah lounges pop up near colleges and universities coast to coast. The combination of research on cigarette smoking and the fact that hookah has been labeled a global tobacco epidemic begs the question: "Can hookah smoking cause cancer?" Hookah is a tobacco mixture, often fruit-flavored, that is inhaled through a water pipe. A typical hookah has a head on top and a water bowl on the bottom, connected by a metal body. Charcoal is used to heat the tobacco, which then passes through the water before entering the mouthpiece to be inhaled. As hookah has become more popular in the United States (as well as the U.K, France, and the Middle East,) an understanding of possible dangers has lagged behind. Among young adults, studies have found that up to 60 percent don't consider hookah smoking to have the dangers associated with cigarette smoking, and some don't even consider it "smoking." So what is research telling us? According to the CDC, hookah smoke is at least as toxic as cigarette smoke. The water in the pipe does not filter out the toxins in tobacco. Just as there are many toxic and cancer-causing chemicals in cigarette smoke, there are many dangerous substances in hookah smoke. A review looking at studies conducted between 1991 and 2014 found that hookah smoke contains 27 known or suspected carcinogens. Some of these include arsenic, cobalt, chromium, and lead. What is less well known is that the concentrations of toxins in hookah smoke and cigarette smoke can differ; some carcinogens occur in higher concentrations and other in lower concentrations in hookah smoke. Examples include carbon monoxide (which is present in higher levels in hookah smoke than cigarette smoke and can contribute to heart disease) and benzene and high molecular weight polycyclic aromatic hydrocarbons (PAHs) for which levels are higher in hookah smoke than cigarette smoke. In contrast, levels of tobacco-specific nitrosamines and low molecular weight PAH's may be higher in cigarette smoke than in hookah smoke. One reason that hookah smoke may be more toxic than cigarette smoke is simply the amount of smoke that is inhaled. In a typical "session" of waterpipe smoking (roughly an hour), 200 puffs are inhaled, versus the 20 puffs ordinarily inhaled in smoking a single cigarette. This translates into a typical hookah session resulting in the inhalation of 90,000 ml of smoke, versus the 500 to 600 ml of smoke inhaled with a cigarette. Hookah also has a source of toxins not found in cigarette smoking. The charcoal used to heat tobacco in a hookah pipe releases carbon monoxide and other chemicals, and in fact, carbon monoxide levels in people exposed to hookah smoke are significantly higher than those in people exposed to cigarette smoke. People tend to inhale hookah smoke deeper into the lungs than cigarette smoke. At this time, we don't know if this finding is significant, but it may help to look at changes in lung cancer after the addition of filters to cigarettes. Before cigarettes had filters, the smoke was not inhaled as deeply and was more likely to cause a type of lung cancer known as squamous cell carcinoma. This type of lung cancer occurs most often in the large airways entering the lungs (the bronchi) and due to this location, tends to be discovered at an earlier stage of the disease. With the addition of filters to cigarettes, lung adenocarcinoma became more common. This type of lung cancer often occurs in the periphery of the lungs, and due to this location, is often found in the later stages of the disease. This is speculation, but the bottom line is that we know carcinogens present in tobacco smoke are also present in hookah smoke, but the way we see the damage present down the line—in damage or cancer—may be different than what we are seeing now with cigarette smoking. A final difference between cigarette smoking and hookah is exposure to infectious diseases. Whereas cigarettes are usually smoked alone by an individual, a hookah pipe is usually shared by several individuals, as they "pass around" the pipe at a hookah lounge or home event. Bacteria or viruses present in the mouths of fellow hookah smokers may be "shared," including microbes like the oral herpes virus. As a last note, don't be fooled by advertising which says hookah doesn't contain tar. It is the process of burning (with cigarettes) or heating (with hookah) which creates tar. In fact, hookah smoking may result in higher exposure to tar as it is smoked for a longer period of time and requires a stronger drag. Hookah smokers may be at risk for the same cancers caused by cigarette smoking, due to exposure to similar carcinogens, as well as other cancers related to the burning of charcoal and pattern of inhalation. Lung cancer - Several of the same lung-cancer-causing carcinogens present in cigarette smoke are also found in hookah smoke. Esophageal cancer - Several studies have found hookah smoking to be a risk factor for esophageal cancer while carcinogens in cigarette smoke which predispose to esophageal cancer are also present in hookah smoke. Oral cancer - Tobacco irritates the tissues in the mouth and throat, and as seen with people who chew tobacco, causes inflammation which can lead to cancer. Stomach cancer (Gastric cancer) - Recent studies have shown an association between hookah smoking and stomach cancer, as well as precancerous findings in the stomach of regular hookah users. Bladder cancer - Epidemiological studies associate hookah smoking with bladder cancer. This is not surprising since in the United States it's felt that 50 percent of bladder cancers in men are caused by cigarette smoking. Pancreatic cancer - Studies have noted that hookah users have an increased risk of developing pancreatic cancer. We also know that hookah smoking increases the risk of gum disease (periodontal disease) and that gum disease is now known to be a significant risk factor for pancreatic cancer. Possibly leukemia - Benzene, a known carcinogen which contributes to blood-related cancers especially acute myelogenous leukemia (AML), is present in hookah smoke. 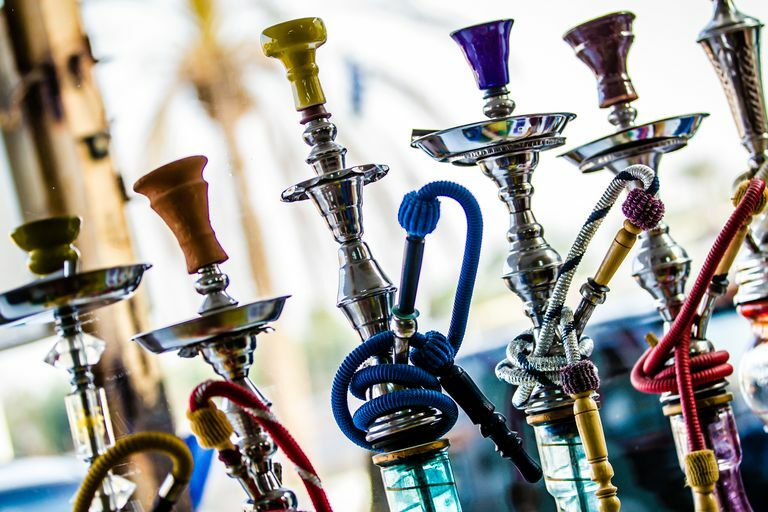 Researchers evaluated 105 hookah smokers and 103 hookah non-smokers who were exposed to hookah smoke measuring the breakdown products of benzene before and after exposure. Hookah smokers had a level 4.2 times higher after smoking in a hookah bar and 1.9 times higher after a home event. Disturbingly, levels also increased 2.6 times in exposed non-smokers. It's still too early to know the exact cancer risks associated with hookah smoking, but it seems wise to use what we know about tobacco and cancer in talking to our youth. We don't know the latency period for exposure to hookah and development of cancer (the latency period is the time elapsed between exposure to a cancer-causing substance and the development of cancer,) but we do know that the latency period between tobacco smoke exposure and cancer can be many decades. It could also be that hookah smoke, due to greater or lesser levels of some carcinogens than cigarette smoke, will contribute to types or subtypes of cancer not ordinarily seen with cigarette smoking. There has been little research to date looking at the effect of secondhand hookah smoke on exposed non-smokers. Environmental tobacco smoke (ETS) or secondhand smoke refers to a combination of mainstream smoke, sidestream smoke, and smoke exhaled by smokers. Since many of the toxins and carcinogens present in cigarette smoke are present in hookah smoke, a good starting point is to look at the effects of secondhand tobacco smoke on adults and children. Yet, there may be some differences as well. The secondhand smoke from hookah may be different from that inhaled secondhand smoke from cigarettes, with much of the exposure being made up of smoke exhaled by the smoker. Whether this is good or bad is another question. The study on urinary benzene levels in non-smokers exposed to hookah smoke is concerning (see under leukemia above). It is also concerning that the tobacco-specific lung carcinogen NNK (4-[methylnitrosamino]-1-[3-pyridyl]-1-butanone) is found in higher levels in the bedrooms of children exposed to weekly or monthly hookah smoking. Just as with cigarette smoking, there are many other health conditions related to hookah smoking that go beyond cancer. Some of these include heart disease, premature births, emphysema, and infertility. Until we know more, it may help to consider what we knew about cigarette smoking before it became wildly popular, relative to what we know today. Al Ali, R. et al. A comparative study of systemic carcinogen exposure in waterpipe smokers, cigarette smokers and non-smokers. Tobacco Control. 2015. 24(2):125-7. Chaouachi, K. Hookah (Shisha, Narghile) Smoking and Environmental Tobacco Smoke (ETS). A critical review of the relevant literature and the public health consequences. International Journal of Environmental Research and Public Health. 2009. 6(2):798-843. Centers for Disease Control and Prevention. Hookahs. Updated 11/24/14. El-Zaatari, Z., Chami, H., and G. Zaatari. Health effects associated with waterpipe smoking. Tobacco Control. Epub 2015 Feb 6. Jacob, P. et al. Comparison of nicotine and carcinogen exposure with water pipe and cigarette smoking. Cancer Epidemiology Biomarkers and Prevention. 2013. 22(5):765-72. Kassem, N. et al. Benzene Uptake in Hookah Smokers and Non-smokers Attending Hookah Social Events: Regulatory Implications. Cancer Epidemiology Biomarkers and Prevention. Published Online First November 21, 2014. Kassem, N. et al. Children's exposure to secondhand and thirdhand smoke carcinogens and toxicants in homes of hookahsmokers. Nicotine & Tobacco Research. 2014. 16(7):961-75. Koul, P. et al. Hookah smoking and lung cancer in the Kashmir valley of the Indian subcontinent. Asian Pacific Journal of Cancer Prevention. 2011. 12(2):519-24. Mao, W., Zheng, W., and Z. Ling. Epidemiologic risk factors for esophageal cancer development. Asian Pacific Journal of Cancer Prevention. 2011. 12(10):2461-6. Maziak, W. The waterpipe: an emerging global risk for cancer. Cancer Epidemiology. 2013. 37(1):1-4. Sadjadi, A. et al. Neglected role of hookah and opium in gastric carcinogenesis: a cohort study on risk factors and attributable fractions. International Journal of Cancer. 2014. 134(1):181-8. Shilhadeh, A., Schubert, J., Klaiany, J., El Sabban, M., Luch, A., and N. Saliba. Toxicant content, physical properties and biological activity of waterpipe tobacco smoke and its tobacco-free alternatives. Tobacco Control. Epub 2015 Feb 9. St. Helen, G., Benowitz, N., Dains, K., Havel, C., Peng, M., and P. Jacob. Nicotine and carcinogen exposure after water pipe smoking in hookah bars. Cancer Epidemiology Biomarkers and Prevention. 2014. 23(6):1055-66.